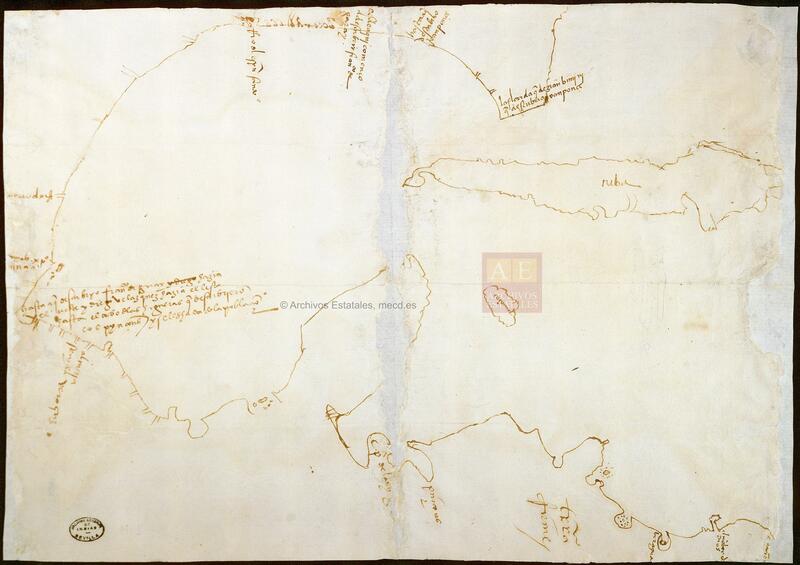 When the Spanish first colonized the Americas in the 16th century, they were starting from scratch, cartographically speaking. The maps of the New World were largely line drawings of the east coast done by explorers and navigators. These were combined to create large scale coastal maps of the entire continent, but they weren’t complete, accurate or in proper scale. Spain needed detailed, precise maps and not just of the coastline to fully exploit its newly conquered territories and to settle disputes with Portugal over who owned what. As a consequence, in the last third of the 16th century King Philip II launched a project to map the entire continent, coastal and interior. To aid in this goal, they employed Relaciones Geográficas, surveys sent to the colonial authorities in every community soliciting an array of information about local geography, languages, natural resources, trade, religion, botany, demographics, place names and topography. The completed surveys also had to include a map of the area. Data trickled in — political boundaries, topographical features, the largest roads and towns mapped using diverse sources ranging from pre-Columbian indigenous tradition to contemporary artists to Spanish officials — but the regional maps, if they were submitted at all, were not the accurate representations Spain had hoped for. Most of them contained no distance measurements (which means no scale) or usable coordinates. Many of the colonial authorities in these towns were local leaders and had no training in formal cartographic methods, and they commissioned the maps from Spanish, Creole and indigenous artists, not people likely to take exact measurements and transfer them to the page. The standards of European cartography were only employed by a handful of punctilious functionaries from Spain. One of the most adept Spanish mapmakers was Francisco Gali, a sailor, explorer, author from Seville who is best known today for having explored the Pacific Northwest coast in the search for a port that could be used by the Manila galleons on their way to Peru. Before making it all the way up north, he arrived in New Spain in 1580. He settled in the town of Tlacotalpa, modern-day Tlacotalpán, in the state of Veracruz, southeastern Mexico, where a group of local mayors asked him to make the regional map demanded by the Relaciones Geográficas questionnaire. Architect and professor of Graphic Engineering at the University of Seville Manuel Morato has been studying topographic maps and regional cartography since 2010. 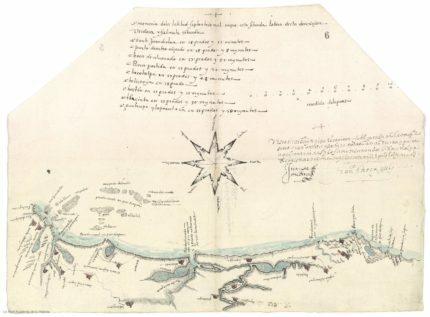 Gali’s map of Tlacotalpa is highly relevant to his interests because it is one of the earliest examples of nautical cartography in Spanish America and is exceptionally accurate. In fact, His study of the map has found that it matches up to modern technologically-derived data with startling precision. Gali produced a hand-drawn nautical chart in February 1580 with great exactitude by the standards of the time. It shows in great detail the coast, the estuaries, bays, capes, lagoons and rivers, and in some areas, indicates the depth of the water. Both the chart and the text of the Relación are kept in the Royal Academy of History in Madrid. According to the text of the Relación, in the local tongue, “náhuatl-Tlacotalpa” means “divided land,” which refers to the fact that the village was founded in the Pre-Hispanic era on an island in the river Papaloapan, as is represented on the map. “The Gali map has been compared with current satellite photographs, and the images are practically the same, apart from the distances of the time and the growth of the populated areas, like the city port of Veracruz and its surroundings,” adds the researcher. So the planimetric deformation of the map, compared with a current one, could be due to the fact that Gali did not take sufficient measurements or that he did so, but too quickly, as he was only passing through the area. North American experts like Barbara Mundy suggest that these deformations could be due to Gali having used an existing padrón (a master map that was updated as new lands were discovered) that included these deformations. In this case, Gali only had to complete the information by adding locations and detailing geographical features. Manuel Morato maintains that this hypothesis is quite unlikely due to the secret nature of the Padrón Real, which was jealously guarded in the Casa de la Contratación in Seville, and of which obsolete copies were destroyed so that they did not fall into the hands of foreign powers. Other causes could have been motivated by the lack of in situ measurements and the impossibility of determining geographical length in the 16th century. Morato ‘s study of the Gali map of Tlacotalpa has been published in The Cartographic Journal. It’s a fascinating read, and not just for map nerds either because it covers so much ground, if you’ll pardon the on-the-nose metaphor. This entry was posted on Tuesday, September 5th, 2017 at 11:43 PM	and is filed under Modern(ish). You can follow any responses to this entry through the RSS 2.0 feed. You can skip to the end and leave a response. Pinging is currently not allowed. The history of navigation is the history of seamanship, the art of directing vessels upon the open sea through the establishment of its position and course by means of traditional practice, geometry, astronomy, or special instruments. A few people have excelled as seafarers, prominent among them the: Austronesians, their descendants the Malays, Micronesians, and Polynesians, the Harappans, the Phoenicians, the ancient Greeks, the Romans, the Arabs, the ancient Tamils, the Norse, the ancient Bengalis, the Chinese, the Venetians, the Genoese, the Hanseatic Germans, the Portuguese, the Spanish, the English, the French, the Dutch and the Danes. According to studies of my own, done in 30 minutes, the place ‘Punta deAnton Ricardo’ (2nd line) with ’18 grados y 8 minutos’ latitude ‘septentrional’ could be at -modern coordinates- 95° 59′ 04,6″W, 19° 03′ 41,2″N in “Antón Lizardo, Alvarado, Veracruz, Mexico” (note that the map is out of line by 45 degrees !). What I did look up: The prime meridian back then used for longitudes, might have been the so-called ‘Ferro Meridian’, running through El Hierro (Ferro), the westernmost of the Canary Islands. The ‘Ferro’ meridian is 17° 40′ 00″ west of the Greenwich meridian. The historical backdrop of route is the historical backdrop of seamanship, the craft of coordinating vessels upon the untamed ocean through the foundation of its position and course by methods for customary practice, geometry, space science, or uncommon instruments. A couple of individuals have exceeded expectations as seafarers, noticeable among them the: Austronesians, their relatives the Malays, Micronesians, and Polynesians, the Harappans, the Phoenicians, the old Greeks, the Romans, the Arabs, the old Tamils, the Norse, the antiquated Bengalis, the Chinese, the Venetians, the Genoese, the Hanseatic Germans, the Portuguese, the Spanish, the English, the French, the Dutch and the Danes.